After years of clock watching and packed lunches and exhausting commutes the day had dawned that Paddy had dreamed of since the day he joined the civil service. Forty years done, grey hairs earned and he was retiring. The pension wasn’t exactly a fortune but Paddy had been saving since his thirties so he knew it would be enough for what he wanted to do. Pottering around his garden and growing apples for his home-made cider. There were so many things that Paddy planned to spend his time on now that it was all his own and the fairer hours of the day no longer belonged to the taxpayer. He might learn to ballroom dance or take up a new language. Nothing too expensive – he was prudent and didn’t want to gamble his long term future on anything too rash in the first few years. He knew of colleagues who sold up and moved abroad to enjoy their retirement somewhere sunnier. They could get plenty of exercise just hiking and walking and not need to spend huge fees on a gym. That idea appealed to him, the hiking at least, so he had bought the walking sticks at lunchtime and planned to take them home with his small box of possessions packed under his desk. It it was five to five in the evening and Paddy started to tidy the desk. The ‘out of office’ email message was already set up to say “Gone Fishing!” As the second hand of the clock climbed to 12 he stood up and put his coat on, quietly picked up his box and walking sticks, and headed for the door. He hadn’t wanted a tea party following a collection from people who couldn’t really afford it and would resent being asked for a presentation by someone who didn’t know him of something he didn’t want. And he didn’t want a fight with his immediate colleagues who would feel he should get this after his years of service. So he was taking all the holidays he had saved up, six weeks in all, and given notification of his retirement in an email timed to send at 6pm. He laughed to himself as he walked to the bus stop. “Gone Fishing!” He would have plenty caught when they realised he had gone. “The secret to unlocking your ideal murder is not just in the planning but in knowing your prey” read the blurb on the dustcover. Karen half snorted at this presuming it was an honest mis-shelf by a trainee shop assistant or an ironic dig sticking it in the self-help section. But no, here it sat unnoticed in the farthest corner behind a copy of “How to Read your Aura.” It was mostly untouched apart from where someone had used a scissors to cut the corner with the original RRP. Karen opened a page at random. “Burial Alive – do’s and don’ts for a motionless mound”. She fumbled the book in surprise and lost the page. Surely this was a joke. She opened it again at the index and ran her finger down the headings: “Beheadings – Accidental or Intentional; Cadaver Maintenance- Sweeter smells; Doorway to Death – your guide to tripwires; Immuration – Be the best brickie. ” Karen looked around furtively trying to work out if she was being set up – where would the hidden cameras be??!? But she was all alone in the deserted anteroom. Nobody there – just the books. She started to feel jumpy. She looked again at the dustcover. There was no publisher’s name. Perhaps it was cut off with the RRP. With a flash of inspiration she knew she would take it. Take it, not buy it – there could be no record! Karen dropped the book into her voluminous shoulder bag and headed for the door. Her hands were shaking with the tension. And her shoulders. Everything was wobbling. On the other side of the world in a little shop in Delhi, Surinder picked up the book in the corner of the self help section. She flicked through the pages noticing the sad and desperate faces in the photographs. She turned to the blurb on the dustcover- “The key to unlocking your perfect murder is not just in the planning but in knowing your prey”. Surinder shuddered and quickly placed the book back on the shelf. Not her thing at all she thought turning to a book on Angel magic. The masks on the front of the theatre were meant to signify the ancient Greek symbol for drama – the comedy and tragedy that are the yin and yang of the stage. But for those who lived and worked in the theatre they represented the flow of life. Beyond the heavy plays, the raucous comedies and the song and dance of the musicals there was a far greater drama in the day to day. The accidents in rehearsal or set building or while hanging from lighting rigs could halt or postpone careers. The heartbreaks and troubles that actors had to put aside while they lifted the mask of performance every night (and two matinees a week). The days when colds, flu or stomach bugs left cast or crew reeling – and yet the old maxim prevailed – the show must go on! So they would draw themselves up, and play their part, lock their disappointments or concerns deep inside, reach for that inner strength and carry on, because if nobody could see the reality then the illusion could be the reality. Moonlight filled the birch grove where Daniel and Emma sat. They held hands and talked about the future…the cicadas drowning the conversations from curious ears. All of their ideas kept leading the in one direction and no matter how they fished for alternatives it didn’t seem to matter. Emma’s star was in the ascendency and Daniel’s trajectory wasn’t close. They would have to lock themselves into her career path for the next few years even if it did mean her being on the other side of the world with the promotion. But Daniel could fly over three or four times a year and look for something there while he was visiting. Both were scared what this meant for their marriage but only time would tell if they could make it. Marilyn’s life was a bit of an affliction. She had been named at birth by a dad who seeing her blond fuzzy hair said she would be beautiful, adored and have a cool elegance like her namesake. Within two weeks she was bald and red skinned and it went downhill from there. It was the uncanny knack she had of doing the wrong thing at the right moment. More than simply being clumsy she managed to do so in a context that made it all the more spectacular. When she she took part in the Miss Teen Ice Cream pagent she was so proud and excited – until the opening number of the evening. When Marilyn glided out at the top of the staircase, serenely waving and smiling, she caught her sandal in her gown and bowled forward taking the other three girls on the stairs down with her like a set of skittles. The time she was asked to sing a romantic solo at her aunt’s wedding a wasp flew in to her mouth just as she hit the high note and she ended up sputtering, gagging and retching all over the bride in an attempt to remove it. Marilyn’s butterfingers were so legendary in her family that her mother used to say it was a congenital condition – dropsy! But even her mum was astounded when she managed to smash an entire glass wall at the health centre when she dropped a crate of files which sent a metal sculpture toppling into it. These disasterous turns had terminated job after job until finally Marilyn found herself at home all the time doing the housework in between interviews. She was out in the garden one lunchtime hanging washing to dry when she heard the doorbell. In her haste to answer it she tripped over the laundry basket, slammed her head in to rotary line and fell flat on the patio. When she came to, there were two strangers standing over her. They were Jehovah’s Witnesses who had been waiting at the front and had heard the clatter as she fell. “Have a calling to comedy? If you think you could make us laugh call us on..” It was a light bulb moment. Thinking about some of the scrapes she had gotten into she realised she had some amazing material. She jotted the number down to phone in the morning – and stabbed herself with the pen as she put it in her pocket. Six months later with the pilot show filmed she sat at the back of a small theatre as it was screened for a test audience. She held her breath and then smiled. They were rolling in the aisles with laughter. The producers shook hands later that day on a full series and Marilyn realised she was like her namesake after all – she had an natural ability to make people laugh! Warren was always the Hard man in our class. He was never top on any tests and often didn’t bother turning in homework or assignments. He said with a shrug that his parents didn’t care how he did so why should he? So he sat at the back of every class room doodling and passing notes and heckling junior teachers. His trips to the principal’s office were weekly but she too knew that his parents were unresponsive and after a couple of suspensions she gave up. It was effectively official mitching as the time off was an incentive for the bad behaviour. On a sunny Spring day our class found ourselves free of the classroom on a field trip to Lugnamaken Castle. The gardens of the castle were huge and varied and ideal for a botany class preparing projects. We all split up and went in search of subject matter and I soon found myself lost deep in the maze. With no sense of direction I wandered up and down the narrow walkways in the sunshine and tried to memorise the steps I was taking. Left, right, right, dead end. I was in a small enclosed picnic point with a little fountain and a bench on which lay Warren apparently asleep in the sun. I headed over to see if he knew how to get out and realised that a swarm of wasps were circling his slumbering form, presumably attracted by the apple cores that littered the space. I screamed and started trying to swat them away with my hands rousing Warren who sat bolt upright into the swarm! And was promptly stung all over his head. He looked dreadful, the stings on his face and neck were beginning to swell and I knew we had to get him to medical help quickly but we were trapped in the maze. The normally tough jock had dissappeared and in his place was a terrified tearful boy. Faced with such a serious dilemma I promised him he would be alright and feigning confidence started to slowly retrace our footsteps all the while calling out for help. Long story short, after many wrong turns and some thinly veiled panic we got out and found a teacher who took us both to hospital, where we were both treated for multiple stings. My parents rushed to the hospital to check on me even though my injuries were very small. However nobody answered at Warren’s house and so he was returned alone to the school by the teacher. In no time at all Warren was back to his sullen self. When asked about his injuries it was ‘no big deal’ – this retorted with a little bit of menace. But I now knew better. I had watched the mask slip and saw how vulnerable and unprotected he actually was. From then on I looked directly at him, the boy behind the bravado. I was originally blogging on the right day but…. So I am away from home and staying at a lovely hotel with my husband. When I went to unpack I realised I left my Story Cubes at home. 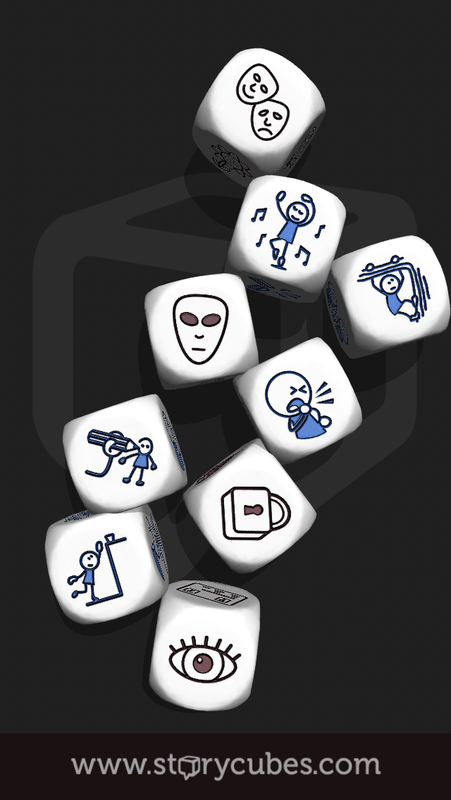 Suddenly remembered that there is a Rory’s Story Cubes app. So now I have prompts on the move. 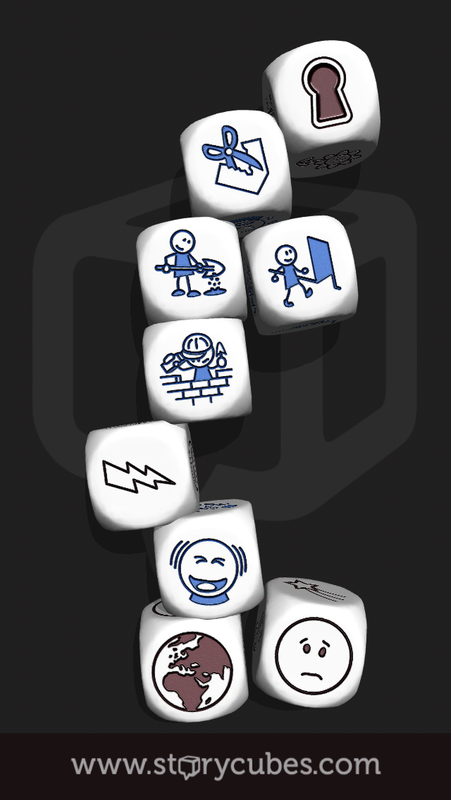 The letter J is brought to you by Story Cubes Actions edition. On the last day of school Mrs Carey set them a project for the summer holidays. Instead of the usual essay on their return she wanted a diary about ”What I did during my holidays”. Daniel really wanted to win the prize in September but he wasn’t sure what would stand out. After thinking about it for a day or two he figured that his diary could be a photo scrapbook. If he could get his mum to take action photographs on his mobile phone to show what happened he could print them up and paste them into the scrapbook with a narrative tying them together. The first week he was attending football camp and his mum got a photograph of him scoring a goal on the last day. Unfortunately he had scored it in the wrong goal which was not very pleasant at the time but his mum said you couldn’t tell from the photo. On the second week it rained every day so he tried exercising at home. He thought it would look cool weightlifting his dad’s weights but the only one he could lift was his mum’s pink dumbbells. On the third week he couldn’t think what to do so his mum suggested that he go ask their elderly neighbour if he could offer her some help. Mrs Emery was widowed and lived alone in the corner house at the end of the road. She thought it was great that he was trying to do something with his hols and asked him to help with her gardening. His mum got an action shot of him digging up a flowerbed and luckily headed home before Mrs Emery realised he had dug the roses and left the weeds. When Daniel got home that evening his mum was watching telly and didn’t hear him knocking then banging on the door so he got caught out in the rain. She did however get a photo of him angry and drenched to the skin when she let him in. He wasn’t impressed but his mum said it fitted the theme of his diary. So so week after week they charted the holidays. Attending his auntie’s birthday party a shot of Daniel presenting her birthday pressie – vouchers for Weightwatchers – and another shot of her showing him exactly what she thought of the present. Taking part in a fun run for charity and collapsing red faced and sweating over the finish line. Entering the local heats of Ireland’s Got Talent with his puppet show and the head falling off one of the puppets. Packing groceries with the swim team in the local supermarket and thinking they should come dressed up meant in costume so he was the only ninja turtle while the others were in shirts and ties. At the end of August his mum took the photos to be printed and Daniel pasted them all into his scrapbook. He wrapped it up with pride to bring with him on his first day back convinced that the prize was in the bag! On the Friday Mrs Carey announced the winner, Stephanie Wynn. Daniel was disgusted after all his hard work. Then Mrs Carey said there was a special prize for the person who had given everyone in the staff room a great laugh – and presented a dumbfounded Daniel with a Wooden Spoon. When the shouting started she would go there. To the quiet space in her head. Where the words couldn’t hurt and anything was possible. Gran had said she was a day dreamer but really it was a safety valve a protective mechanism. In her mind she had slipped away and was scrambling among rock pools near a once visited seaside searching for anenomes and tiny crabs. It had started at home on the bad days but now she increasingly found her imagination taking over. The brown paper bag of potatoes in the pantry was really a wriggling undulating sack of kittens stolen from every back yard from here to the supermarket and if she could undo the stitching they would get out and engulf her in furriness. If she looked at anything for enough it lost its meaning and became something new. The fluffy clouds rushing past the kitchen window resolved themselves into a bowl of steaming rice and a swan as she stared out at them. The broken tile in the shower was really the missing piece of a jigsaw puzzle that, once solved, would complete the human genome, repairing the flaws that caused disabilities. Her thoughts took her into so many places she didn’t need to stay in the one place she didn’t feel safe, her home. The crashing sound outside the bathroom door was followed by a screech. The shadow of a baseball bat raised and swung. She turned the tap open fully to drown the sounds and slipped her head under the water. That was better. The sound of the sea waves in her ears and the shell and fish transfers on the tub helped. She was in a yellow submarine floating along at the bottom of the ocean. She let her imagination take her as the water crashed above her head and she held her breath. The air bubbles floated to the surface as her problems disappeared. I have just realised that my theme choice for the A to Z Challenge means that I am trying to succeed at two challenges – to blog 26 times over he month of April is the main task. But I am finding that it is also quite a challenge to throw 9 dice and try to craft an instant story from the pictogram prompts. 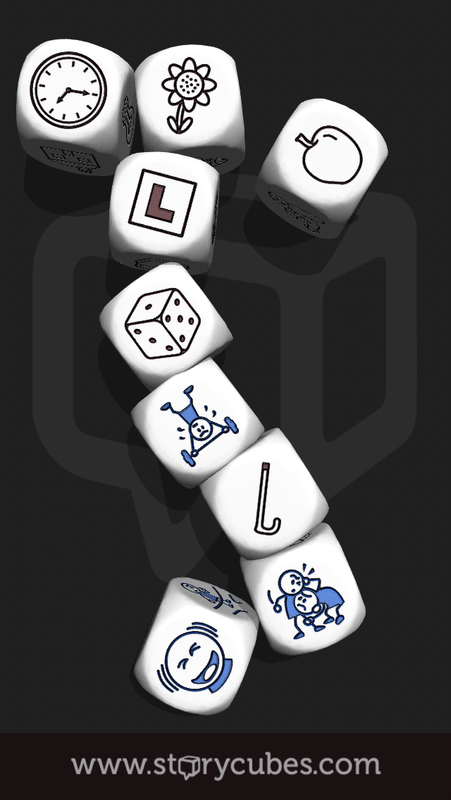 When I throw the dice for the letter H the following nine pictograms fall for me to string together. The annual camping trip was a boring ritual but they had done it since Eloise was a little girl. It mainly consisted of muddy fields, ants in the food stores, camp fires that took hours to light and lost sheep that wandered into the tent at all hours. One year they had ended up abandoning the whole thing because of the cockroach infestation but apart from that it generally passed with very little to remark on. This year they were camping at an commercial campsite with lots of activities organised for the families. There were songs and nursery games for the little kids, clowns and magicians for the older kids. It was possible to pay for day excursions and experiences such as rock climbing and white-water rafting in the hills or paragliding on the lake nearby. But all in all it felt very sterile, not close to nature as they had been in previous years. So when they found out that there was a two night bivouac excursion up into the mountains Eloise had begged to be allowed to go with the other teenagers. Her parents had hummed and hawed, concerned about so many hormones in such a confined space but in the end they relented and on the Friday afternoon the teen team headed off hiking. About an an hour into the hike they met a tiny old woman who appeared to be in a hurry to get down the mountain. She approached the team leaders and a frantic conversation ensued. Eloise couldn’t hear much of it but the gesticulation suggested the lady was entreating them not to go up the mountain. She shrugged and rubbed her eye as a bug had flown into it and it was starting to water. At around 7pm they reached a small clearing and struck camp. It was obvious that this was used regularly with the cold remains of a stone-circled fire in the centre and all the brush and shrubs within easy reach cleared, presumably to start previous fires. Two of the boys headed off to collect firewood while the rest of the campers assembled their makeshift covers. Soon a rosy fire was crackling away with beans bubbling and potatoes roasting in the embers. The entertainment was the usual campfire fare, ghost stories by torchlight and tales of alien abductions. The girls huddled together and the boys feigned bravado but by 10pm they were all bundled up in their two shelters. It was colder up here in the mountains and Eloise was glad her sleeping bag covered her head to toe. The night sounds replaced the laughter and the chatter died down as the fire cooled. From under a loose flap of the bivouac Eloise could see the fireflies in the dark recess at the edge of the clearing like fairies dancing just out of reach of the humans. The camp was slowly bathed in pale light as the full moon emerged from behind a cloud and her eyelids closed as she drifted to sleep. In in the morning it was the silence that woke her. Eloise was always a heavy sleeper when she camped – a combination of fresh air and exercise. But this morning the silence was eerie. She sat up and looked around to see if she was the first up and saw…..nobody. The camp was empty, abandoned, sleeping bags and clothes strewn along the ground. She was the only one there. Eloise sat in the chair by the window. The ticking of the clock was the only sound in her hospital room. She hadn’t spoken a word since they had found her, wild eyed and dishevelled in the remains of the campsite. The doctors said she might never speak again. They never found the remains of the others. Just lots of blood on the bushes round the hillside. Wolves the inquest had ruled. So, in an attempt to get back on track I am publishing my prompts and will edit as I go on. G is now complete. A pill + a snake + cactus + dinosaur head + axe + Viking helmet + angry face + sun/throwing star/sheriff badge + necklace/scarab. The shelf was weighed down with the mementos of his travels. Each peculiar item a bookmark for a chapter in his life. He had begun training as a circus performer shortly after he flunked his first year engineering exams and in time it had led him into stunt work. The Shuriken was the first trophy, a prop from his time as third ninja on the left in the brawl scene in his first proper movie. The throwing star was blunt but polished to look deadly and it caught the light from the low-laying winter sun. A plastic cactus, comical in its proportions, was from a low-budget Mexican crime romp where he had doubled for the Disney Club graduate who was trying to be relaunched as an adult actor. The Viking helmet had one horn broken, not as a result of the stunt he had performed but the after party in a country pub somewhere in Ireland. Beside it stood a stone axe authentically hewn from real rock and tied to a sturdy branch. It was covered in dried mud and fake blood and the wooden shelf sagged from its weight. The dried up rattle from a rattle snake was almost totally obscured by the model dinosaur bone, the relative size of the two reptiles they represented clearly displayed. One had been a gift from a make-up artist he had dated on location, the other he had misappropriated from the props truck on his final day of filming. Mary lifted the final item carefully, a costume amulet he had worn on his last film, “The Curse of the Pharaoh” and dusted around it. She slowly righted everything to its proper place and turned to bed behind her. For a while she had blocked out the sound of the ventilator as she remembered her strong and vibrant boy. The fearless acrobat who could fight and run and crash and fall. So different from the shell of a man now locked comatose in his room. She picked up her book and started to read aloud from the chapter she had paused at. "It is as it is"
Sometimes it just pours out.. Darling, You Should be Writing.